Fighter's Spotlight is an ongoing project concerned with tracking real-world professional cardfighters and their careers. 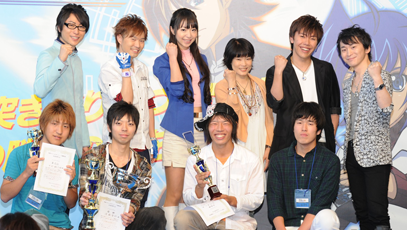 Makoto is third from the left, on the bottom row. Kanamaru Makoto is the reigning regional champion for Osaka, and a past contender for the Fighter's Road 2012 national title. One of the more visible underdogs, Kanamaru was noted for his unusual deck choice and the potential upset it could create between the tournament's many influx of Kagerou and Paladin cardfighters. However, the ultimate upset that Kanamaru created was of a very different kind, when it was revealed in the championship aftermath that he is an inveterate cheater, banned from many shops in Osaka. Following investigation, Kanamaru was penalized for marking the sleeved backings of his trigger cards; for cheating during the Fighter's Road finals, he has been banned from participating in any official games until January 22nd, 20141. Since being exposed, Kanamaru has gained notoriety as the first player to cheat in a professional match. Kanamaru's deck revolves around the Riviere evolution ride line, riding from one Riviere in the line to the next while drawing a card with each ride's skill to eliminate the impact this has on his hand. These costless rides, along with Riviere's innate power-increasing abilities, gives Kanamaru more room to call freely while having an effective defense on his opponent's turn. Kanamaru's trigger choices are arranged so that he can call Drive Quartet, Flows as an alternative booster, gaining +3000 power from Shuplu being on the field; while Shuplu is herself only a 4000-power booster, with the additional power Top Idol, Riviere receives from her skill, these two can form a column strong enough to oppose any unit under 11000 power. Top Idol, Riviere's skill acts in favor of his build, which omits stand triggers. By prioritizing the vanguard's attack, Kanamaru can potentially activate her persona blast on-hit, empowering three Bermuda Triangle rearguards by +5000 power. Prism of the Water's Surface, Miltoa along with Ameer further promote multiple calls, while simultaneously searching the deck for additional pieces in the Riviere chain. Mermaid Idol, Flute's skill benefits from these calls, increasing her power up to levels that allow for unassisted attacks on higher-power vanguards once Riviere's persona blast readies her for battle. Super Idol, Salem also works offensively with Riviere, rising up to 18000 power with the Top Idol's and her own skills before being boosted. Finally, Top Idol, Pacifica cycles out unneeded cards, forms her own 20000-and-up column as an alternative to Riviere, and even builds for a megablast in the event that the deck's other counterblast skills have not been used. It needs to be mentioned that, as only one of the other cards in this deck outside of Pacifica and Riviere use counterblast, the odds of Pacifica connecting and using her skill from the rearguard increases exponentially as a vanguard Riviere continues to be guarded. This forces the opponent to choose between taking a persona blast or a megablast. While this deck lacks the Triangle's favored return-to-hand tactics, its aggressive slant and ability to quickly fill the field while pressing the opponent to guard can exhaust any cardfighters' resources in short order.